Shoney’s menu prices right here. Get ready to have a meal fit for a king at the Shoney’s family restaurant. It’s a fast-paced casual dining place to enjoy delicious food, beverages, and desserts. Serving breakfast, lunch, and dinner they have a huge selection to choose from. Shoney’s has weekly (All-You Care-To-Eat) specials that are available Monday through Sunday. Be warned these meals are for those with a huge appetite. So make sure to come with an empty stomach and leave some room for dessert. For those with a sweet tooth, Shoney’s has an amazing dessert menu to select from. One of their popular treats is Christy’s Apple Crisp. Featuring fresh apples cooked in a cast iron skillet drenched in a sweet cinnamon sauce. Topped off with toffee caramel, pieces of walnuts, oat crust crumble and vanilla bean ice cream. Just the sound of it makes one’s mouth water. Below are the latest Shoney’s menu prices. Some of Shoney’s award-winning breakfast dishes include steak & eggs and biscuits & gravy. For dinner, they offer many hearty dishes like their famous Wild-Caught Pacific Salmon with Sweet Heat Glaze. Some of their sides include Brown Rice With Sweet Red & Yellow Bell Peppers, Baked or Mashed Potatoes, and Macaroni & Cheese. Fans of Shoney’s can sign up to members of the newsletter e-club. Members will receive regular emails that provide the latest news, updates, and promotional offers. Sign-up is accomplished through the Shoney’s website. The first iteration of Shoney’s began in 1947 under the name Big Boy by Alex Schoenbaum. After changing the restaurant’s name from Big Boy to Shoney’s they were more successful making it possible for them to quickly expand and spread out across the United States. Doubling their profits within the first four years of business. Today, it is known as Shoney’s North America Corp. headquartered in Nashville, TN and run by the CEO and chairman, David Davoudpour. Today, there are over 230 Shoney’s franchise restaurants in 17 U.S. states mainly in the Southeast, Mid Atlantic, and Midwest region. 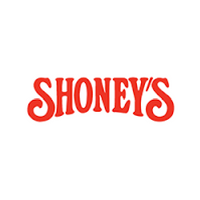 For more information about Shoney’s, please visit their website. What are Shoney’s hours of operation? I love shoney’s food I went with my friends and I got all American Burger it was big I had to get a to go box. Agree! I miss the original “Big Boy” sandwich. They still list it on the menu, but no one knows how to make it. The last few times I’ve ordered it, it comes out with different types of meat patties and a standard bun top in the middle! I won’t be back.